BSA believes creating a love of the game starts from early childhood. The BSA $’s program promotes what we like to call "fun and focus soccer". We work heavily on foot-skills, small sided game play and decision making, all in a fun environment. Game related soccer is heavily utilized to keep the kids attention. Touches on the ball are key and rarely will the players be without a ball at their feet during this program. Individual skill development is stressed and 1v1 and 2v2 scenarios are common. We generally play 4v4 and incorporate the “numbers system” and allow the players better positional awareness and, thus maximizing their touches on the ball and allowing them to make decisions from a very early stage. Advanced Travel teams are selected to represent BSA at different levels of competition within the Mid NJ Youth Soccer Association Leagues. Players at this level have played travel soccer before. The club's vision here is to create an environment where players can compete, develop and have fun while receiving quality training. 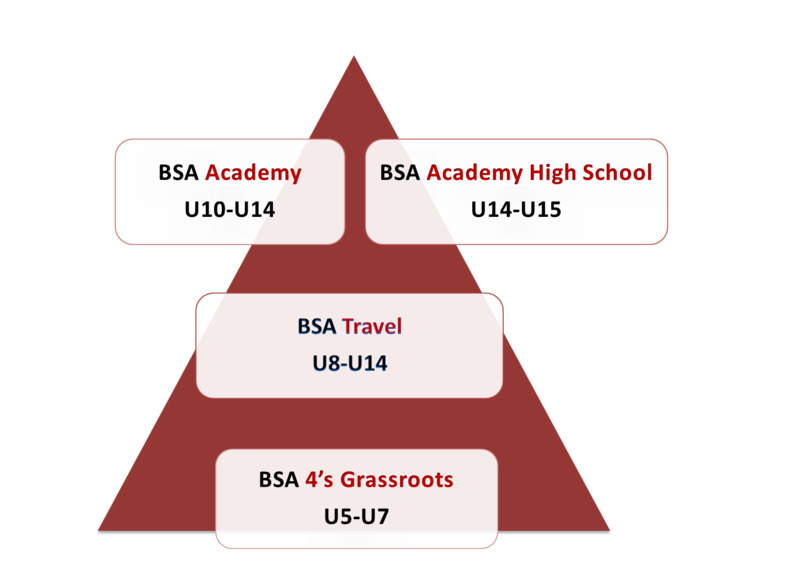 BSA Academy U10 - U14 Program - This program for advanced soccer players looking to make a greater commitment to the sport than our current travel program offers. The program will provide year round player development. Teams are chosen to represent BSA at the Top Levels of competition within the EDP Soccer League. Players at this level show strong aptitude towards the game and should be dedicated to the sport. The club's goal with this level is to provide a program that allows these players to develop and reach their soccer goals. The Select teams will have the opportunity to play high level state and regional tournaments throughout the year. BSA Academy High School U15 - U18 Program - Players from U14 age groups move to our BSA Academy High School Program. This program is a great compliment for a players HS team and our goal is to prepare these players for the competitive levels at their respective schools. Players will play outside of their HS season (spring and summer) which also includes a winter season.